Vintage and classic wedding cars are a popular choice of wedding transport for couples choosing a traditional wedding theme. 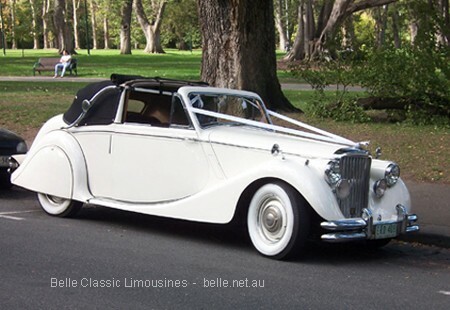 Belle has one of Perth’s largest collections of vintage themed vehicles is available from Belle Classic Limousines. Centrally located in Guildford at the doorway to the Swan Valley. 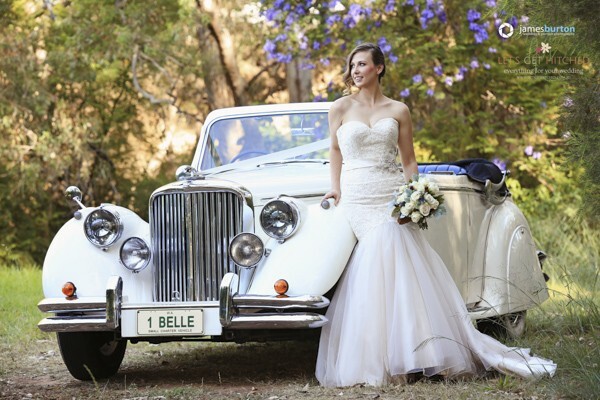 The cars are available for weddings throughout the greater Perth metropolitan area including Fremantle, Joondalup, Rockingham and of course our home in the Swan Valley. We also often make our way to Yanchep in the north, Mandurah in the south and York in the eastern fringe of Perth as well as Margaret River and the south west (supply to these locations is conditional upon the cars preferred and the time of the year). This page is largely dedicated to helping clients better understanding the many terms associated with traditional wedding transport so you can confidently discuss various wedding cars. You do not need to be an expert at car lingo to inquire about or book your wedding cars but this may help you feel more at ease. The term vintage car is generally applied to vehicles produced between 1919 and the early 1930’s. The period loosely bounded by the WW1 and WW2. The major style guidelines for cars in this period are large free standing headlamps and running boards along the cabin of the vehicle. Many of the features evident in the cars stem from the era of elegant horse drawn carriages that populated the streets of major cities in Europe and North America in the late 1800’s and early 1900’s. 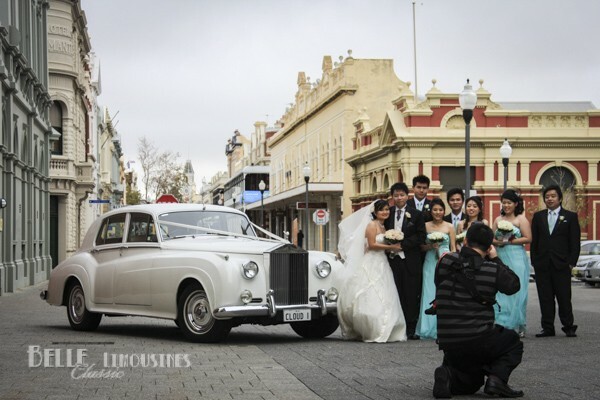 Few genuine vintage period cars find their way to weddings in Perth, then mainly on loan from a family friend. 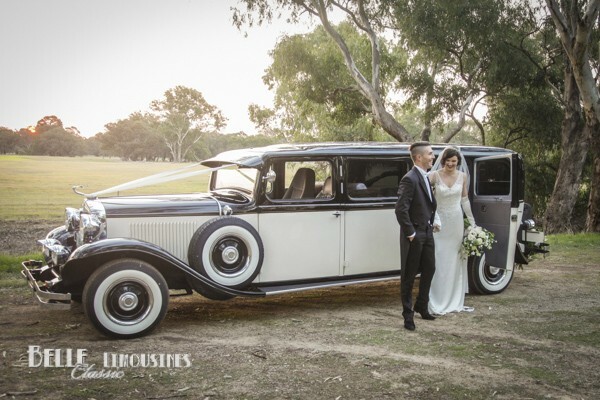 The only 1920’s-1930’s looking vehicles in Perth for hire are the stretched hot-rod Ford and Dodge limos that cruise the city and our 1934 REO SpeedWagon limousine. All but the REO SpeedWagon are modern replicas built of new parts that can be bought in America. The 1951 Rolls Royce Wraith wedding car from Belle Limos is the most authentic wedding car of the vintage style even though it was hand-made by one of the finest coach-building firms in England after WW2 – making it one of the last of the post-vintage coach-built cars manufactured. The post-vintage period contains cars built in the period between the early 1930’s until about 1950 which includes the popular Jaguar Mk5 convertibles, sedans and limousine available from Belle Classic as well as the Rolls Royce Wraith. During this period in England car production largely stopped from 1937 until 1947 whilst industry focused on the production of trucks, planes, munitions and tanks for the war effort. When production resumed in the late 1940’s the cars where based on the vintage look of the mid 1930’s until new plant and design templates could be added to the factories to modernise the cars. American cars from this period look more modern than the British cars because the war did not effect their domestic production as much. The term classic car is less specifically defined but generally applied to vehicles produced between 1950 through to the end of the 1960’s. This period resulted in full bodied cars with curves and fins, but loosing the sweeping running boards and prominent headlights. The Jaguar Mk9 and Rolls Royce Cloud wedding cars are beautiful examples of British cars from this period of automotive history. The term modern classic car is also widely used to describe the rarer collectable cars from the 1970 – 1980’s, especially sports cars and expensive luxury cars like the Rolls Royce Spirit stretched limousines. Obviously the term originally stemmed from the era when well-to-do people had a chauffeur on their staff who drove, prepared and maintained the car and acted as the butler when driving the owner or family on an outing. Originally chauffeur cars had a separate compartment for the driver which flowed on from the period of horse drawn coaches when the reinsman sat outside of the carriage to drive the coach. The most famous chauffeur cars in the world were the Rolls Royce limousines that where only afforded by the super rich and royalty. These days the term chauffeur car is mainly used to describe chauffeur driven luxury sedans that are used for short corporate charters and airport transfers. 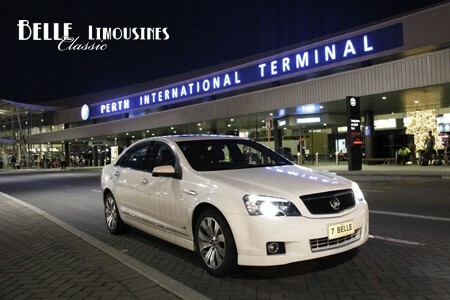 The most common chauffeur car in Perth is the Australian made Holden Caprice which has more leg room than most of the Mercedes, BMW or Chrysler sedans registered as an SCV (small charter vehicle). Convertible is the modern name for a car with a collapsible roof allowing it to convert from a covered carriage to an open air car when the weather permits. Although most convertibles have two doors, many four door convertibles were made in America as well. Modern convertibles mainly have a powered roof which may be made from metal or fibreglass as well as the traditional cloth or woven materials. The coupe is derived from a French horse drawn two door carriage which had only one forward facing seat behind the reins man for the passengers. The term now describes any two door fixed roof vehicle and is predominantly used for sports cars even though the rear seat in many may be too small for passengers these days. Following on from a coupe, the drop head coupe (DHC) is a two door convertible. The main distinction between a convertible and a DHC is the ability of the drop-head to fold back just the front of the roof with the rear carriage being supported by the ornate carriage arms. These cars are often referred to as a three position DHC. If later modified to an electric roof the DHC loses this flexibility and so should be simply called a convertible. The Belle Classic Jaguar Mk5 drop head coupe is an original car still with the manual three position drop head. Limousines were originally a luxury variation of a small passenger carriage with the driver separated from the passengers by a dividing barrier. Originally the driver or chauffeur’s compartment was open, but in time the word limousine became associated to vehicles where the driver’s area is covered to be part of the body of the vehicle. In time the term was used to describe any extended wheel base car with a division between the driver and the passengers. Currently many businesses describe their chauffeur cars as limousines and the term has become somewhat lost to its original use. 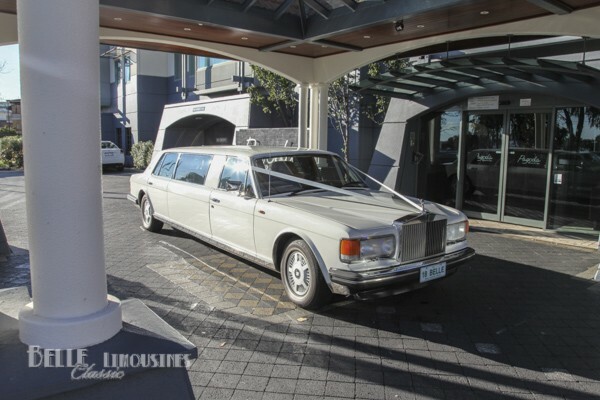 Stretch limousines like the Belle Classic Rolls Royce Spirit limousines and Chrysler limos fit the modern definition best, and the Belle Classic Rolls Royce Wraith is the truest example of an original limousine available for weddings in Perth. Sedanca de-Ville is the European / British term for a limousine when the driver’s compartment has no cover or a removable cover. I think this style of vehicle had significant meaning in differentiating the status difference between the chauffeur (servant) and the family as an indicator of wealth. Often the passenger compartment would be upholstered in extravagant materials or fine leather and the driver’s area would be cramped and upholstered in poorer materials or cheaper vinyls in later years. In the horse-drawn carriage era the reins’ man would sit in the open outside of the main cabin which was a clear class distinction and the sedanca de-ville models this arrangement. The American term Town Car was originally used to describe sedanca de-ville limousines. These days the sedanca de-ville style limousines are revered for their unique style and highly collectable. Town Car is the American term used to describe the sedanca de-ville style limousine with many famous vehicles owned by movie stars and Presidents. I have included town car as a separate entry because of the interesting divergence of names over the generations. In America the term town car is predominantly used to describe a chauffeur car (as in the first style noted above) which is a short hire sedan used for corporate charters and airport transfers. The two terms are both used by various SCV businesses in Perth.